For Reimu, how about the Greedy Oonusa/Merciless Purification Rod, ReimuA's shot from DDC? As for Sanae, it could be something miracle-related such as the Staff of Moses. *Level 1: 80 > 160 healing. 4 MP > 8 MP. *LeVel 2: 200 > 300 healing. 8 MP > 16 MP. *Level 3: 340 > 540 healing. 12 MP > 24 MP. *Level 4: 620 > 900 healing. 16 MP > 32 MP. *Level 5: 940 > 1600 healing. 20 MP > 40 MP. *Level 6: 1280 > 2500 healing. 25 MP > 50 MP. *Yumemi: No longer has Bluff command. *Level 2: 1000 power > 800 power. *Level 3: 1400 power > 1050 power. *Level 4: 1800 power > 1300 power. *Level 5: 2200 power > 1600 power. *Andvarinaut: Now only grants +1 Yen per step when equipped by Reimu, and grants Double Yen when equipped by Komachi. *All chests in Corpse Cave will no longer respawn upon opening them, giving one chance from the random chests. 11 1/2 years. That's how long this game has been in development, ever changing over the years. It originally started as a silly little fangame, based on one single dream I had for the Touhou series, about what mythological stuff from other countries haven't shown up yet in the series. This was back when I actually played a lot of Touhou, and was into Touhou a lot. Nowadays, I don't even deal with the series, or rather, I haven't dealt with it outside of Soku and this game for the past 4 years. The game was putrid trash, not having any real form of customized...well, anything. The character battle sprites and overworld sprites were the most I had, but the maps were absolute trash, and the battles were very bland and generic and boring. This game saw a lot of criticism for the terrible mapping and bland gameplay, especially on the old site known as Pooshlmer where it was frequently updated on. Eventually, after reaching the 50% mark of the game as I considered it (which is the Caves to Makai), I decided to finally go back after about a year or so of not working on the game to fix up maps, and that took up another part of a year to do that alongside fixing up old bosses. Afterwards, I FINALLY pushed myself forward after 2-3 years of not going beyond the 50% mark to actually get the game done. The game evolved and evolved, and it ended up a bit bloated with a lot of various quirks and whatnot with equipment, characters, and statuses. A bit of a "feature creep", as one may say, as I figured out more fun ways of doing coding due to DynRPG and its plugins. However, in the end, I believe this actually helps make the game a bit more unique and exciting from what it would've been otherwise. 11 1/2 years ago, I started a little fangame that took up hours upon hours of time, and got me connected to a few people here and there, some of whom I've lost contact with over the years, some of whom I still talk to to this day, if not very often. Some of whom were of massive help, whether it be with coding, graphics, or testing, some of whom were really big jerks. And some whom had promised to do things, but vanished and were never heard from again. Today, I have finally finished said game. After testing the final boss and the ending, it is all done. However, even though the game is "done", it's still not "DONE". How so? Well, so to speak, there's still quite a bit of testing and polishing left to do for the game, which requires more testrunning through the game for Blue Magic, different party configurations, equipment, treasures, enemies and bosses, and shops. So yes, the story may be done, all maps may be done, heck even as it is the game can be considered done, but I'm not done with it quite yet. If you, yes you, the ones that have helped with this game, are willing to help with more testrunning to help with polishing and finishing the game once and for all, please, lend me your aid one last time, so that I myself can finally finish this one single game. Who knows? Maybe after this game is done, I'll finally start my own original game. Maybe...though that may never happen as I am no graphic artist meaning no way for me to do original spriting and graphics. But only time can tell...only time can tell. Howdy all! So, it's been a good long while since I last posted, but at long last, I do believe the game is now finished! 99.99% done, at least, there's still a couple things that I haven't been ABLE to do (still looking for a spriter for a character), and there might still be bugs and glitches here and there, but overall, the game is actually done after nearly 12 years in the works! As usual, anyone that is willing to testrun the game for bugs and glitches, feedback, etc. would be highly welcomed! But for now, I will consider the game "DONE". Which...in a way, kinda makes me both very happy and very sad...I don't know how to feel overall. Just started playing and I really like this! There is a bug with the party switch item, it sometimes makes the party leader on the field move very fast when you add characters, this also happened after the cutscene where you fall under the school. I'm not sure how to get the party leader to have their old speed again after that, seems to persist after saving. Do you have Sakuya in your party, by any chance? She has an overworld passive that increases your walking speed by an extra notch. There is a specific enemy that needs to be defeated first before you can even think of damaging Alice at all. That is all the tips I will give on that fight. Perhaps you store both the current and previous party in 2 variables and the previous party gets cleared from all the party swaps from the previous scenes? I didn't change any party members when the SDM party members met up with the Youkai Mountain party members, I just left the party selection scene (they were already equipped) perhaps this is the bug? EDIT - Should be updated on the RPGMaker.net site now! There were some variables and stuff that wasn't in play when you got both parties back together BEFORE going into the HRCS area, THAT is what caused the issues after the PC-98 Marisa fight. As for Yorihime yeah, not sure why she isn't going back into the party if you haven't added anyone else into it afterwards. She won't come in if you have 4 party members ever, so if you leave the place, come back with a 4th party member, and try to add her, she won't join. Perhaps the screen was faded to black but never unfaded? Or the scene was unloaded before the screen was faded back to normal? Yeah, that's exactly what happened. For some reason after all is said and done, it just...never changed it back to normal. Weird...updated it on the site, so grab that and see if that fixes it (it SHOULD, but you never know, coding might be in the wrong spot still...). Or at least is there a way to obtain the demon charm later in the game? Cutscene fixed, your player doesn't disappear in the following cutscenes though but that fixes itself after a few cutscenes. After the Vina cutscene sequence I'm kind of lost as to where to go, Seiga appeared and took some weapons and I assume you need to go to the fallen shrine, though I'm not sure where to start looking. Hmm?? You mean that the player is still visible during those cutscenes?? Which ones were those? That is to the wrong area. 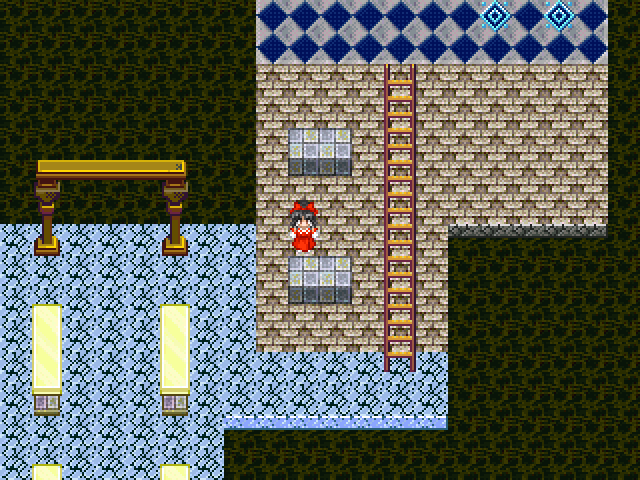 There's another cave in Gensokyo you have to go through to get to the Fallen Shrine. I believe that's the one with the walls you have to check?? Underground + Cave to Makai + Magic Stones Void: Some bridges you can walk under are NOT obvious, I was stuck there for a while until i realized "this isn't a wall, its a bridge"
Lastly, any plans for a sequel or continuation? Flashbacks...where did they take place? Do you recall? Glad you liked the game! Makes me happy to hear someone enjoyed playing through it, much less fully finishing it! There are a couple optional bosses that you can fight, if you really want to give them a try (and they do need testing). If you'd like, I can point out where they are to find them easier? Unless you've already fought them all and somehow managed to beat them?? And yes, the fragment's names are related (i.e. Elpis is literally translated as Hope). Chaos is the odd one out, being a name I came up with since it felt like it fit her well. There's no plan for a sequel of continuation of THIS game, but I HAD planned on doing a game specifically for the Fragments themselves, being a CANON game to just them. *Door in Void Castle should be fixed now. *After talking to Patchouli, Sakuya will give you the hint you need (since she would have some kind of idea of how to deal with that). *Two of those optional bosses were bugged with players not being reset, and now should be fixed. *A certain superboss in the Void has no warning before fighting him, but the location where he is at is CLEARLY marked now to warn you "Hey, this might be bad...". *Do you know where these are at (Pandora's Box/Roofs)? Possible screenshots can help me more. As for the last fight it wasn't too bad, considering you have a lot of items at that point in the game, though I might have been a little overleveled, my party was around lvl 50. The fragments were the part of the story I least understood, and what the temple was even for and why they worked there in the first place. So that's a great idea for a "sequel"
The entire area was playable, just...it was TOO big (the biggest area in the game) and could potentially take up to 2 hours or so just to explore the entire place IIRC, since it was SUPER easy to get lost. And as it was, there wasn't even anything of note to find there. No enemies, no items, etc. The bosses that WOULD have been there were all dummied out, and were just relegated to the flashbacks. There wasn't any bugs with it or anything? That's the big issue I'm worried about. Level 50 is about what I was hoping the player would be anyways, I think when I got there I was around that level (and of note, I did all of the last few segments of the game, from the last Skill Shop in Pandaemonium to endgame without any skill upgrades, so I was doing about 1000-1500 or so with my strongest non-Yuuka attacks, so I could make sure they WERE doable if you never found the hidden skill shop in the Void). As for Hope being a pacifist and all you might be able to do something like team with Fate, Chaos or Gloom from early on? Or something similar to Undertale where battles are based on dialogue/actions and more like puzzles you have to "solve". Extinction is very powerful, aye, though it IS very risky and resource consuming as well I think. I could be wrong, it might be GROSSLY overpowered in fact. I actually never used Chaos's skillset since I like using Hope's initial skillset the most (a few are like that too that I know that's played the game. Nobody ever uses Gloom's skillset like ever lol...poor Gloom). So if I may ask, here's some questions for ya since you finished the game! 1) What part of the game did you like/dislike the most? 2) Any boss(es) that you found to be the most easy/difficult? Superbosses are separate from this, of course, but I'd like to hear about them too, assuming you've fought them all. 3) Any favorite/hate character (in terms of story and in terms of playability)? 5) Anything you would think should have been different (other than missing graphics, of course, since I don't have anyone to do the graphics for the two characters that are missing them...)? 6) Any favorite/hated part of the story? 7) Any favorite/hated characters out of the OCs (that are not Touhou characters)? Eirin could well be Artemis from Greek Mythology since she uses a silver bow and is related to the moon. I'm not sure how good basing the game off Undertale would be but the combat concept could work. 5) Alot of the later games indoor rooms felt too big. Pandaemonium has some dead ending corridors in the upstairs floor and some rooms that are too big. But yeah, did you fight any of the superbosses (outside of Hakurei Shrine, Youkai Mountain, Remains of Hells, and inside Silent Shrine and The Void)? o.o? 1) Oh? What exactly about both parts did you like (and what part of Makai? You mean the entirety of the Makai segment? I assume because the story actually felt like a story and not all over the place. I can understand Cave to Makai, it does drag on a bit TOO long, but it's meant to be the intermediary between the two points of the game, so that's kinda why it's the way it is, even with its own unique music~). 2) Oh right...forgot Kotohime lol. I'm assuming you mean the non-joke fights with her and the actual fights? Surprised to hear Alice remains the hardest boss, figured there'd be others that'd be tougher than her, but I do think she's one of the more challenging ones for sure. 3) Ah, Tenshi. I think she's fought a total of 9-11 times total in the game, excluding repeat fights like in Hollowed Caverns? She's a tenacious one, that one. What makes you like Marisa the most, if I may ask? 4) I tried really, REALLY hard to get that puzzle to work. I know it's also really confusing too, especially if you're going for all the rewards, but I'd like to think that it turned out decently enough? Utilizing those Fire Emblem zodiac icons wasn't easy either. Don't know what you mean by the passage underground though? 5) Care to explain? Like which indoor rooms? For buildings? Because I can agree that while I tried my best to make them not that big, some are still pretty big (and I never fully remapped Pandaemonium simply because it was a hassle to even deal with...). Interesting, someone actually using Suwako (and Sanae too. Before nobody used either, mostly because both were pretty bad). Suwako isn't TOO broken, is she? I know she's got some terribly strong stuff, but I'm hoping that she isn't overly powerful. Finding balance is really hard (same with Extinction and Chaos's skillset, are those too broken/good?). 1) I liked pretty much all of the Makai segment for the reasons you stated. Suwako's Ancient Jade was really useful as it could reliably inflict slowness in boss fights (also poison/drain) and the effects stacked (casting Ancient Jade twice didn't remove the first cast's effects). 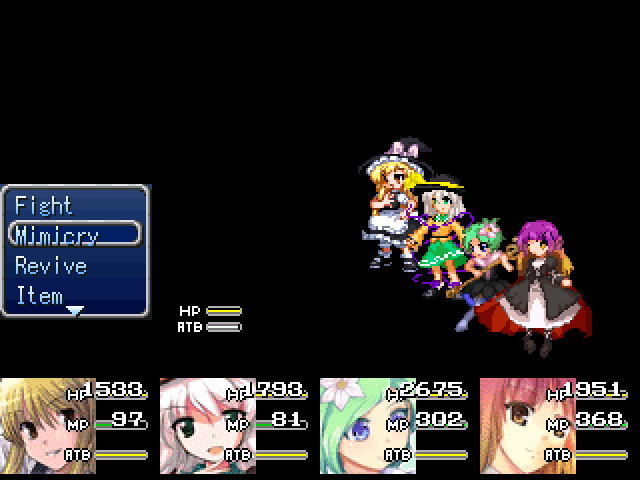 Sanae had cheap healing (comes in handy on the field). Extinction is the only ability I could find in the game that could deal more than max damage 9999 to bosses and with a fast party its possible recover from it before the boss gets their turn. Is this super late in the game or...?? May be easier to just tell me, I can find the maps from there. I'm assuming it's at the end of the story segment.